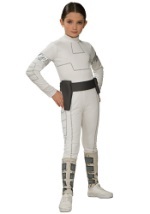 Let your daughter be a princess for the night in this Star Wars Princess Leia Halloween costume. 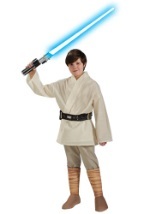 The kids Star Wars dress is made of a heavy white material with wide sleeves and a back closure. A belt with detailed foam front and tie back give the costume shape. 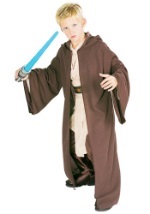 The brunette Leia wig with the classic bun style is included in this costume. Add more of your favorite characters from Episodes 4, 5, 6 to this girl's Leia costume!